I must start this blog entry with what I think was a pretty funny story; I just hope you find it funny as well (even if it is dorky). I wanted to make a new grilled cheese the other day but had absolutely no idea what to include in said sandwich so I went to a local grocery store to search their cheese department. At first, I couldn’t find any cheese that piqued my interest. Nothing. It was all the same stuff and I was frustrated. Then, magically, I found one cheese that I had heard is amazing but had yet to try. (More on the cheese later.) I didn’t find anything else that I needed so I got in line and waited for my turn. Once I made it up to the front, I told the checkout lady that I just had cheese. That is when the gentleman behind me said, “You just came in just to get cheese? !” and chose to laugh. He pretty much thought I was crazy that I only came to the grocery store to get cheese. I simply said yes, and then talked to the lady cashier who asked if I had tried another variety of cheese from the brand that I purchased. I paid and walked out mumbling to myself about the fact that I have a cookbook coming out and my love of cheese and that he shouldn’t be judging me. Little does that guy know that he was just talked about on the Internet on a grilled cheese blog. Ha. (Ok, so maybe the story was funnier in person/in my head…) Regardless, the cheese I did purchase, Beecher’s Flagship Handmade Cheese, was delicious. Read on for all the details. Every once in awhile I would stumble on the mention of Beecher’s Handmade Cheese, mostly when people were mentioning their favorite types of cheeses or if awards were recently handed out. However, I had never seen Beecher’s in this area. I had never even know how to obtain Beecher’s, besides ordering it online, obviously. I never saw it at Whole Foods. I had never seen it at Heinen’s (a local grocery store). Honestly, I never really gave Beecher’s a second thought. Until today. Now, I will never forget Beecher’s nor Beecher’s Flagship Handmade Cheese. It was that good. 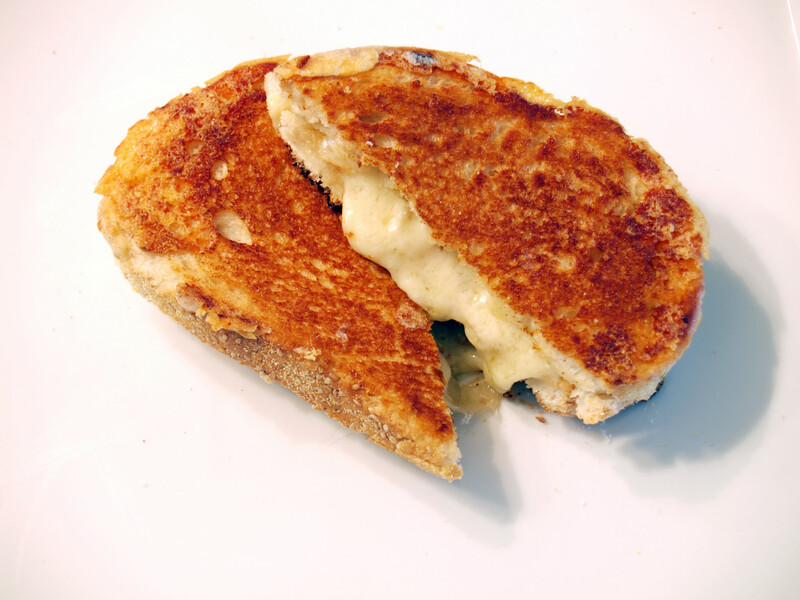 This grilled cheese was that good. I feel that my biggest downfall in writing this blog is describing the flavor or tastes of certain things. That is the problem I am having now, trying to describe this cheese. It was creamy, nutty, smooth and so much more. I had no preconceived thoughts regarding this cheese and I am glad. This cheese and its flavor simply floored me and my taste buds. 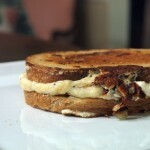 I honestly had no idea what to include in this grilled cheese, especially since I wanted to feature the Beecher’s cheese. For a split second, I thought I may just go with the typical bread and cheese. Then, I realized we had a fresh white onion waiting for me at home that was purchased by my dad at a local farmer’s market. 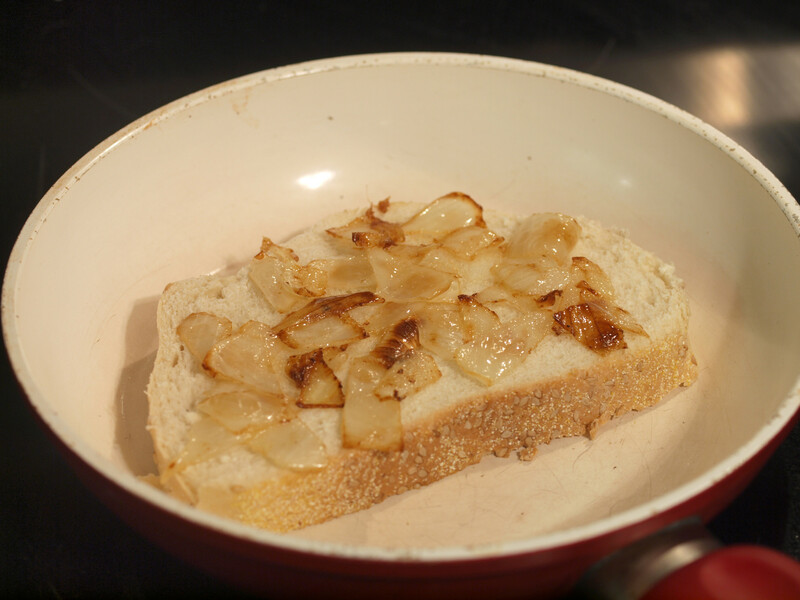 I didn’t want to simply use raw onions so I went ahead and caramelized them. 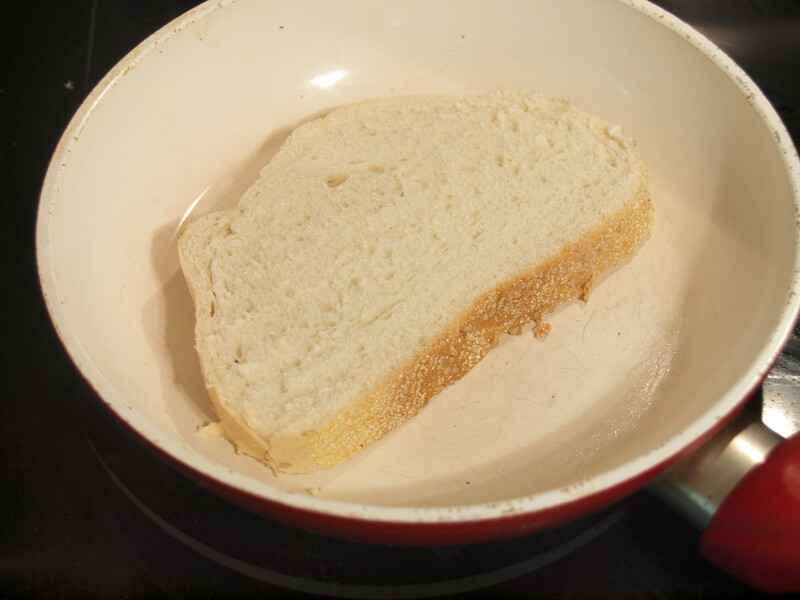 I only made enough to make one layer on one slice of the bread. 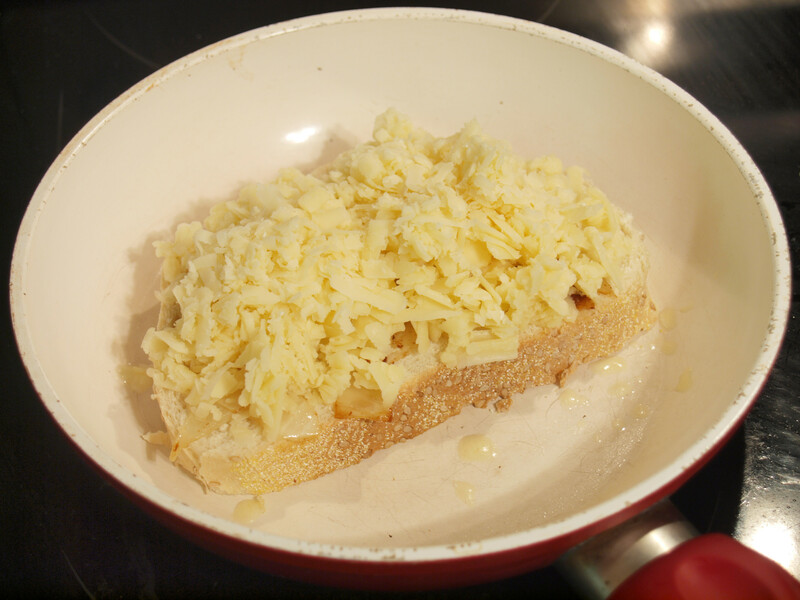 I didn’t want the onions totally overpowering the cheese and sandwich. The amount was perfect and truly added great flavor. 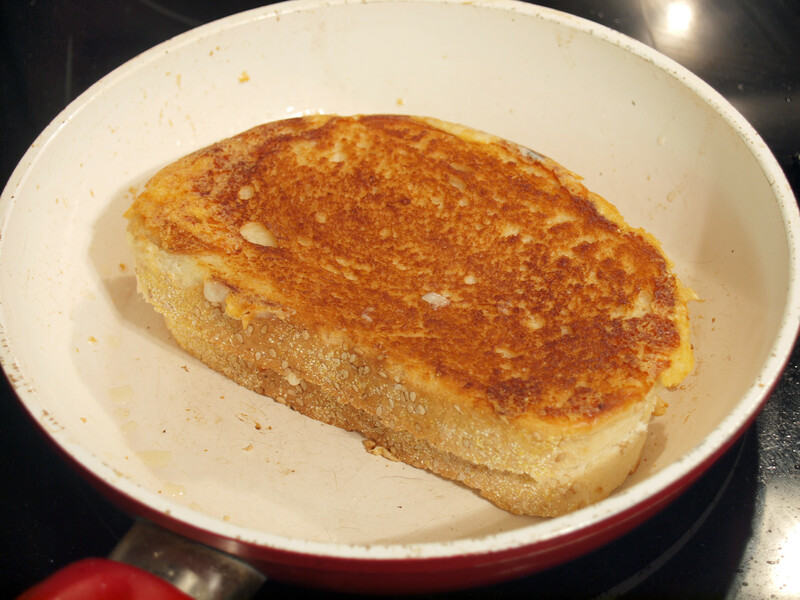 Since the focus of this particular grilled cheese was the cheese and the caramelized onions, I wanted a plain/non-invasive bread as the container. Thankfully, I had fresh Italian bread waiting for me at home. It worked out very well. 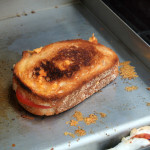 When the day began, I had no idea what type of grilled cheese I would be making. 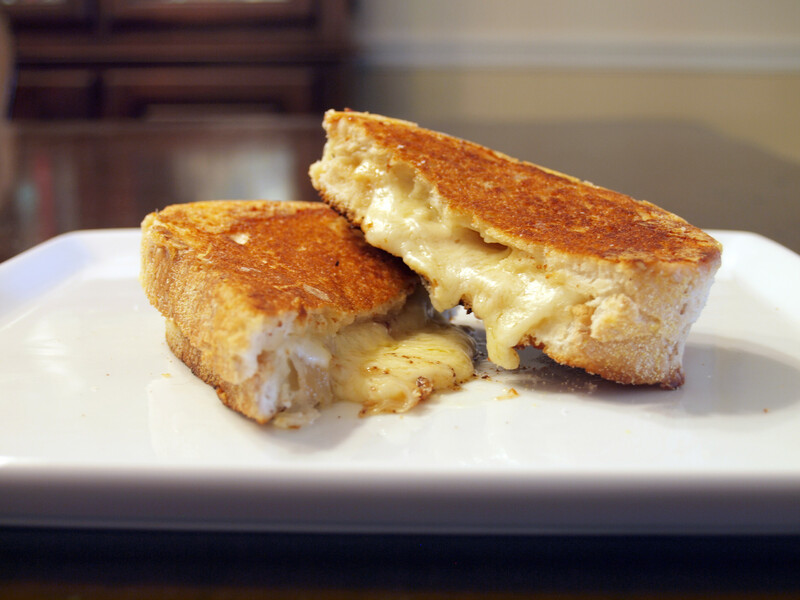 At the end of the day, I had just consumed an amazing grilled cheese consisting of an even more delicious cheese. The Beecher’s Flagship Handmade Cheese deserves all the praise it receives and more. Both the texture and flavor combines to create a very delicious cheese that needs to be tried by all. (If you have already tried Beecher’s, let me know in the comments.) 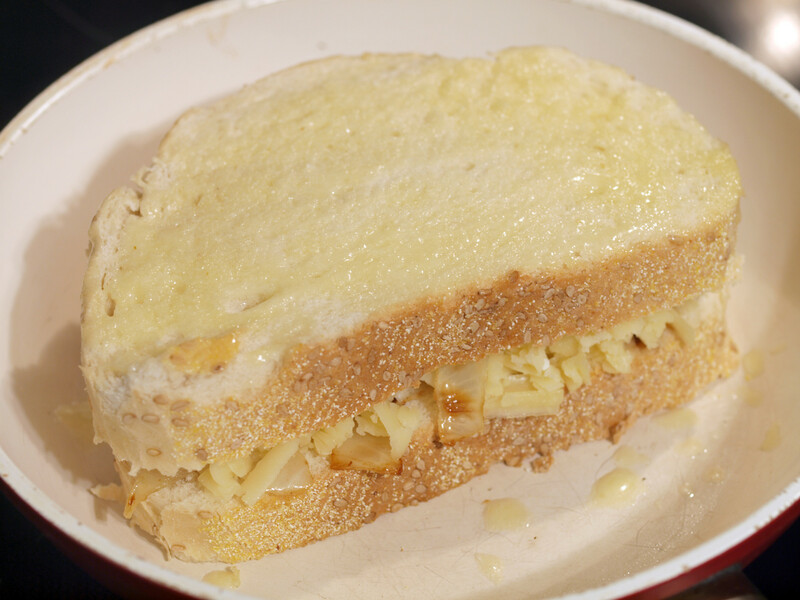 Combine an amazing cheese with garden fresh, caramelized onions in between two slices of Italian bread and you have yourself a winning combination. 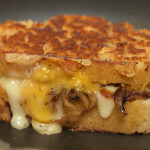 Posted in Grilled Cheese and tagged A, beechers, beechers flagship handmade cheese, caramelized onions, grilled, italian bread. I like the story a lot and it actually sounds really yummy! Suddenly made me hungry!!! Add some crimini mushroom slices with those onions. 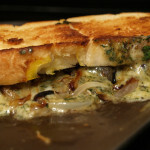 The earthiness of the mushrooms with the creamy cheese is a perfect fit!